Finally, the April mittens are done! (I got a little sidetracked by the Hello Sailor Handwarmers). Of course, for April I went with an April showers theme. This mitten is knit in a heathered blue that I thought looked a lot like a rainy sky with its touches of grey. Blue seed bead raindrops fall on a bright yellow umbrella. The umbrella is only on the back of each hand. I added it with stranded knitting twisting the yellow yarn every three stitches across the palm. You could also use intarsia in the round if you don’t want to strand the yarn for that distance. I had never knit with beads before, but it was really easy and they added just the effect I wanted. 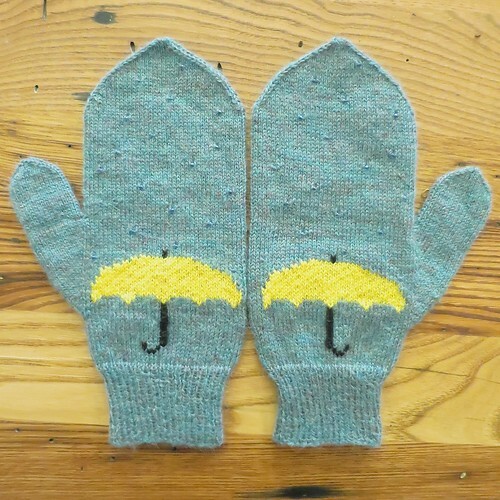 The handle of the umbrella is stitch on after the mittens are knit using duplicate stitch. 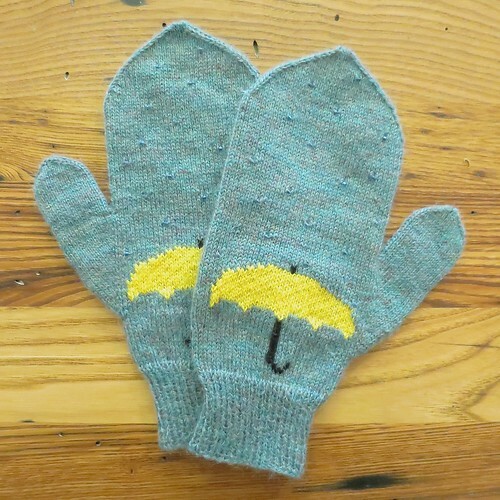 Download the April Showers Mittens Pattern (with chart) or just the April Showers Mittens Chart. For the right hand work the umbrella chart before the thumb. For the left hand work the chart after the thumb. String the beads on the yarn before you start knitting. I turned the end of the yarn into a “needle” to make the stringing easy. I trimmed the end to a point and then coated it in glue (just a school glue will work). I twisted it into a tight point. Once dry, I was able to slip the beads right on. When you come to a stitch where you want to add a bead, bring the yarn to the front. Slip the stitch purlwise. Pull a bead up and place it as close to the right needle as you can. Bring the yarn to the back and continue working the row. Cast on 70 stitches. Divided between three needles. Join together to knit in the round placing a stitch marker between the first and last stitch to make rows. Row 14: k38, m1l, k1, m1r, k38 (79 stitches) You may find it easier to keep track of where the thumb stitches are if you place a stitch marker before the m1l and after the m1r. Cut the yarn leaving about a 10-inch tail. Finish the hand with either kitchener stitch or by weaving the tail through the remaining stitches and pulling tight. I used kitchener stitch. Place the 29 stitches from the stitch holder on three needles. 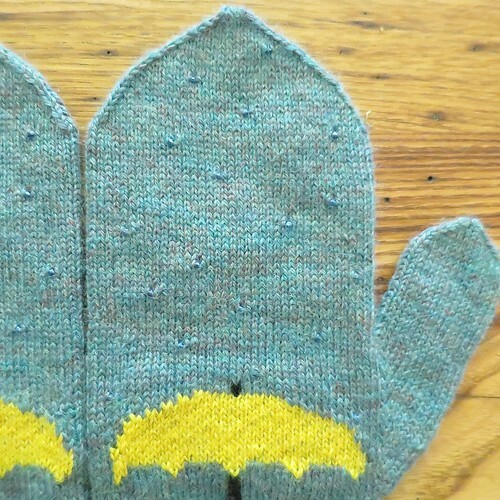 Pick up and knit two stitches from the hand of the mitten. Place a stitch holder after those two stitches to mark rows. Cut the yarn leaving about a 10-inch tail. Finish the hand with either kitchener stitch or by weaving the tail through the remaining stitches and pulling tight. Weave in ends. Use the chart to duplicate stitch the handle of the umbrella on in black. This pattern was not test knit so please let me know if you run into any mistakes. Beautiful. I am so glad I got to see them in person! And the beads are so perfect for water. 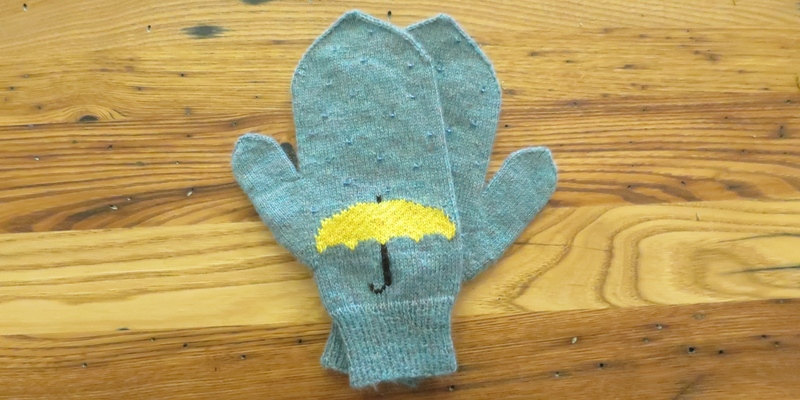 These mittens are adorable and just perfect for April. Great job, Kat! Merci pour ce très beau modèle de mitaines pour les petits enfants c’est agréable pour eux. If you sized it down a bit, it would be cute for kids too! Great patterns! Can I put a link to your site on another knitting website? Yes, you can put a link. Just not reposting the patterns 😉 Thanks!